As we are several people in our household all our stuff can build up fast and create somewhat of a mess. Storage bags can be great to keep your stuff tidy and why not make one on your own. 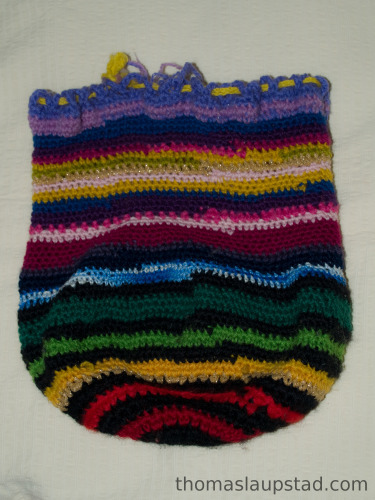 Here is a picture of hand crocheted bag that one of my friends have made. It was originally meant to be a beanie hat, but did not turn out exactly like that 😉 She used leftover yarn to crochet the bag after the hat got too big. The bag looks very nice and is handy for storing our stuff.